Just one in six councils in the UK still collect non-recyclable waste from the majority of homes in their area every week. At least 10 authorities switched to fortnightly rounds or announced plans to do so in the past year, research by the BBC has found. The government said councils had a responsibility to collect waste regularly. Councils say the move saves money and improves recycling rates. Figures for 391 authorities in the UK show 67 still collect the majority of their households' non-recyclable waste weekly. Some, such as Falkirk and Conwy, have moved to monthly collections while 15 areas do collections every three weeks. In some parts of London - Kensington and Chelsea, Islington, Westminster and the City of London - a majority of households have their bins emptied more than once a week. In Southwark there is a mixture as almost 68,000 flats have their waste emptied more than weekly while almost 45,000 homes have a fortnightly collection. Will weekly rounds ever return? Not all forms of weekly waste collections are in decline. The government wants all English councils to provide a weekly collection of food waste by 2023, claiming authorities would be given funding "to meet new rising costs" of the target. Veolia Group, who provide waste management services to some local authorities, said the scheme made "sound environmental sense" but needed funding. The Local Government Association in England said there was "more to be done to boost [waste] collections" but any changes would have to be "fully funded" by the government. Which councils have announced changes? Enfield council said it was also in discussions about moving to fortnightly collections, but had not yet done so. Councils began switching to "alternate weekly collections", picking up recyclable waste one week and non-recyclable the next, in the mid 1990s, with about a third of councils having switched by 2007. Data from the Waste and Resources Action Programme (Wrap) shows about 3.6 million households in England, Scotland and Wales have moved from weekly non-recyclable waste collection rounds to fortnightly or less since 2012. That compares with about 11 million in 2012 households across England, Scotland and Wales had some form of weekly bin round for residual waste - rubbish that cannot be recycled. It leaves roughly 28% of homes with a weekly collection. Comparable data for Northern Ireland was not available. Councillor Steve Evans from City of Wolverhampton Council said the authority switched to fortnightly collections in autumn 2018 to save money. "I can't honestly say I did it for the environment," Mr Evans said. "We had to cut costs because our funding has been cut. "But we were in the minority of councils that still had weekly rounds anyway. "When we were consulting residents about this on Facebook, we had people who live over the border in South Staffordshire (the neighbouring district) replying 'welcome to the real world, we've had fortnightly collections for years'." A spokesman for North Tyneside council, which made the switch in August 2018, said the changes came after a £3.5m government grant for weekly collections ended the previous year. Many councils said the move was made to boost recycling rates. Mid Devon District Council said their fortnightly scheme had seen recycling rates rise by 54%, whilst Malvern Hills District Council said it had taken away 500 tonnes more recycling waste since the changeover in April 2018. Both Adur and Worthing councils said they expected to see recycling rates increase between 5% and 7% after they switch in September 2019. 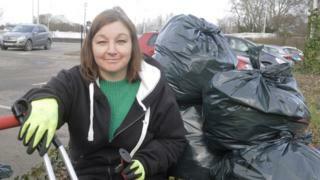 Becki Woolrich runs community litter picking events in her area, which has a fortnightly bin collection. "I've seen a lot of areas where household waste has been dumped," she said. The 41-year-old from Stafford said people who did not have a car would find it difficult to dispose of waste at the local tip. She said: "I don't think there is any encouragement for people to recycle, I don't think a lot of people get it." Joel Lewis, from Coventry, said large families often had "overflowing bins" since the city council moved to fortnightly collections in 2017. The 32-year-old bought an ex-council bin lorry and now runs a business collecting waste between the council's rounds, which is incinerated for energy. "Sometimes people forget [to take the bins out] and then it's a month between collections." he said. A spokeswoman for Coventry City Council said extra waste bins could be provided for those who needed them. "We are one of the largest cities to have changed the way bins are collected," she said, adding the council emptied about 900,000 bins with very few complaints. In Birmingham, the city council started temporary fortnightly collections in February because of industrial action but intends to return to weekly rounds after a new deal was tabled. Government figures show the amount of household waste sent for re-use, composting or recycling in England has stayed at between 43% and 44% since 2011. Provisional figures for Wales show a 61% household waste recycling rate in the 12 months ending September 2018. In 2008, the EU set targets for member states to recycle 50% of household waste by 2020. Claire Shrewsbury, head of programmes at Wrap, said fortnightly collections had "significantly increased recycling rates" in the UK. Where services had been reduced, she said councils needed support to put in place "high frequency" food waste collections. A spokesman for the Ministry for Housing Communities and Local Government said overflowing bins were "a health hazard and an eye sore". "Councils have a responsibility to meet the expectations of the local people they serve," the spokesman said. "This means ensuring waste is collected regularly and contractors do their job properly."